The Tuscany Door Style, a recessed center panel door with an eased edge outside framed profile and a beaded inside edge, is part of UltraCraft’s Vision line of cabinetry featuring the exclusive and cost-effective Eurotek® Veneer finish. Eurotek Veneer utilizes the latest in micro-woodfiber technology along with laboratory-tested, baked-on, catalyzed-conversion varnish to give Vision doors a color-fast and durable finish. 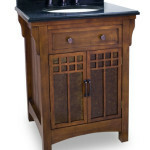 Tuscany finishes also include a Patina that is similar to a glaze highlight on a solid wood door giving the door style increased depth and beauty. Evoking Southern charm and hospitality, the Charlotte Door Style, is well suited to Traditional as well as Transitional and Contemporary styling. 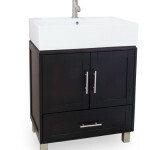 You can choose the standard slab drawer head or opt for the 5-piece drawer head look. 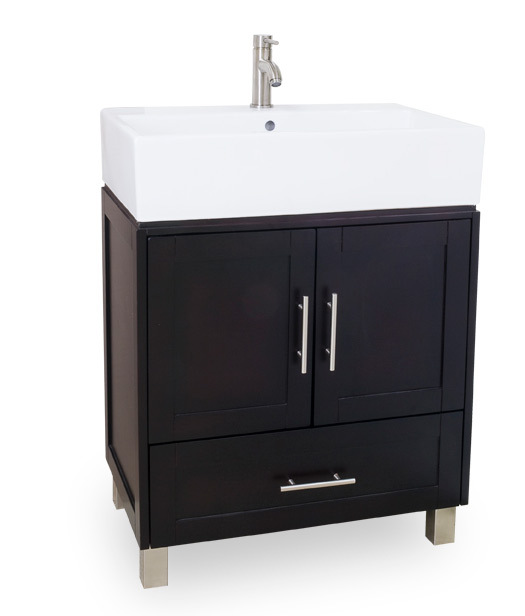 It’s clean lines and modest inside and outside edge frame profile are a perfect compliment to it’s mitered construction and recessed center panel construction. 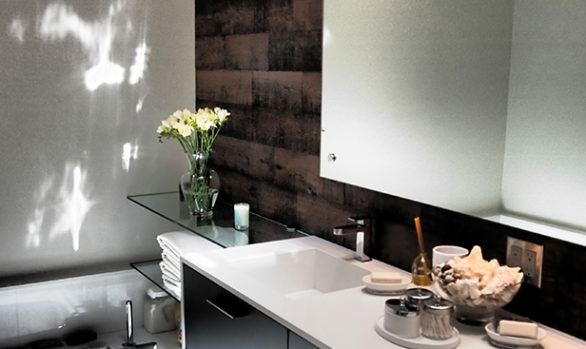 Whether painted or selected from five of seven available wood species, UltraCraft’s Charlotte door style will provide the right backdrop to your next remodeling project. 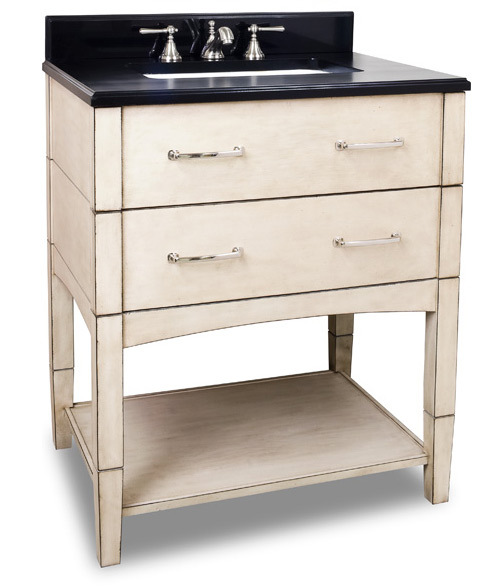 The Andover Door Style can be paired with either a slab or 5-piece drawer front. 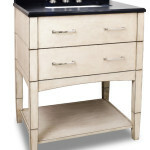 By adding the 5-piece drawer front your design will take on a slightly more traditional look. 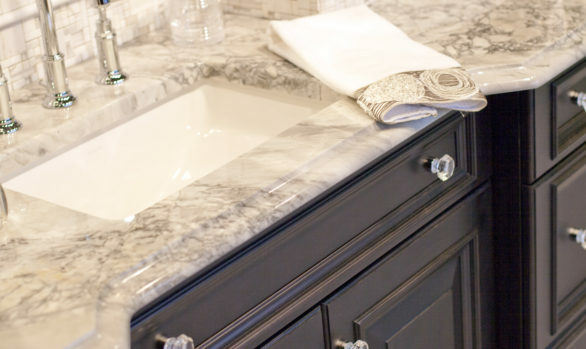 The slab drawer front reduces the amount of molding detail overall and creates a look with cleaner lines and hints towards a more transitional or beau arts design aesthetic. Rails and Stiles are 2-5/16″ wide, but the addition of the applied molding detail give this door a beefier feel without overpowering the veneer recessed center panel. One of UltraCraft’s most popular door styles, Andover looks especially refined when it is paired with a glazed stain or painted finish. 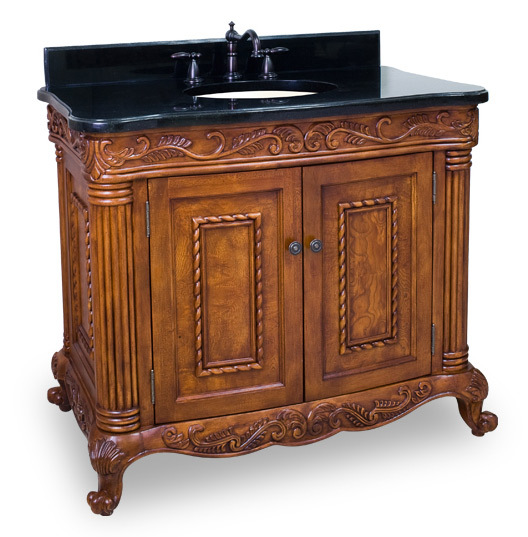 Contact a Distinctive Cabinetry Bathroom Designer today to select the perfect bathroom vanities in combination with your cabinetry style. 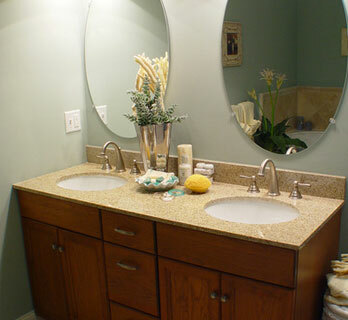 Sharing a bathroom with another person is easy if the two people never need to use the sink area at the same time. 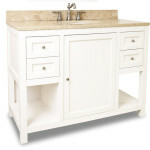 However, for two people who need to brush their teeth, wash their hands, or use the sink for any other purpose at the same time as each other, a double bathroom sink vanity is the perfect idea. 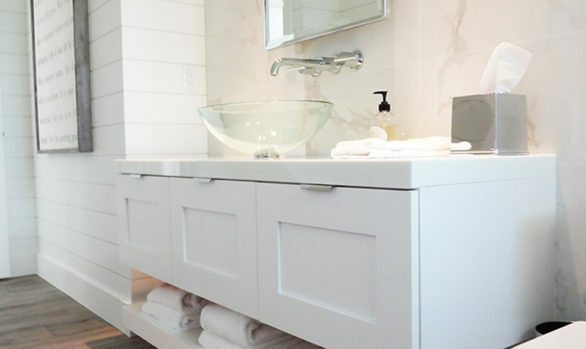 Double sinks can offer a good solution to an age-old problem of not enough sink, counter, or mirror space in the master bathroom. 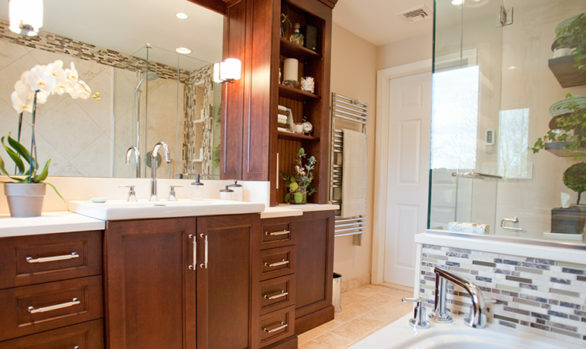 If there is enough room in a master bathroom for two separate sink areas, then this is a good option to choose when remodeling. Even if it’s not currently a useful option, it may become a valuable asset in the future. 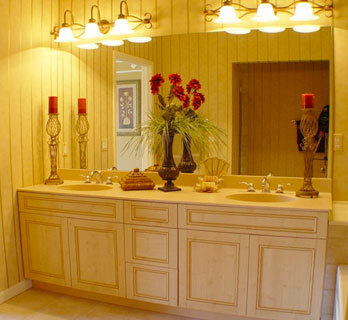 For example, if the house must be sold at some point in the future, a remodeled master bathroom with a double vanity can be a real benefit. 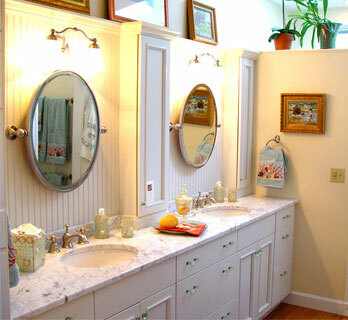 When a master bathroom is shared by two people who both work regular business hours, and both must get ready for work at the same time each morning, a double vanity is the only way to go. 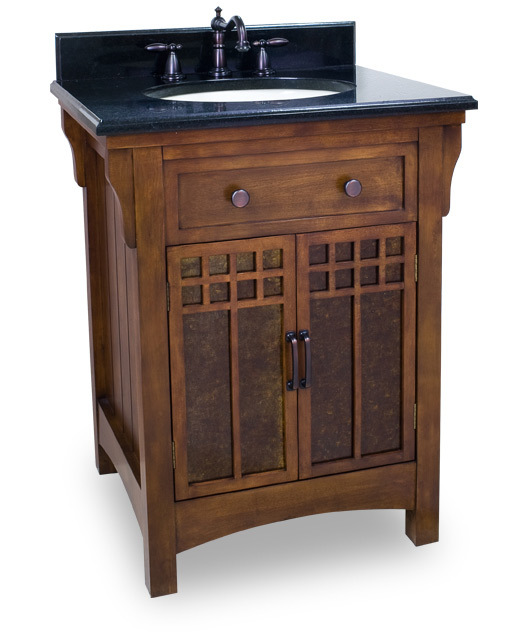 Instead of fighting for sink, counter and mirror space, each person can have their own individual area that they can “own.” In addition to a double sink, each sink can have its own medicine cabinet associated with it, so that personal items can be nearby. Double vanities are common enough that they can be purchased as standard items from any bathroom remodeling store. 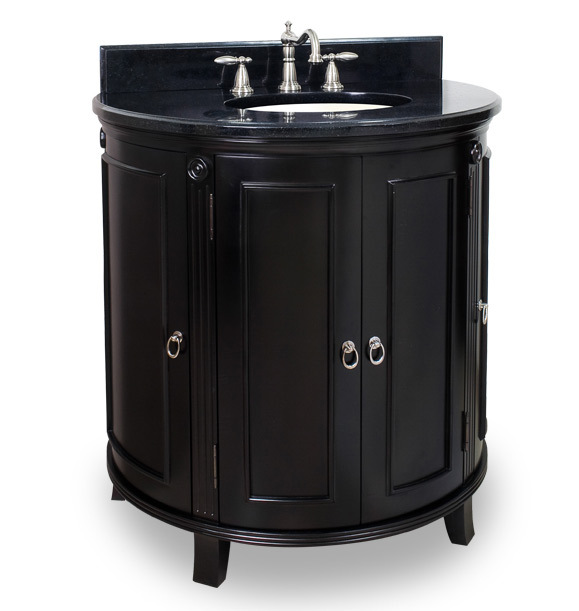 They are also for sale in many large hardware chains throughout the United States. 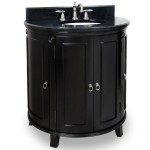 However, for a more custom and specific double sink vanity, they can always be custom designed. 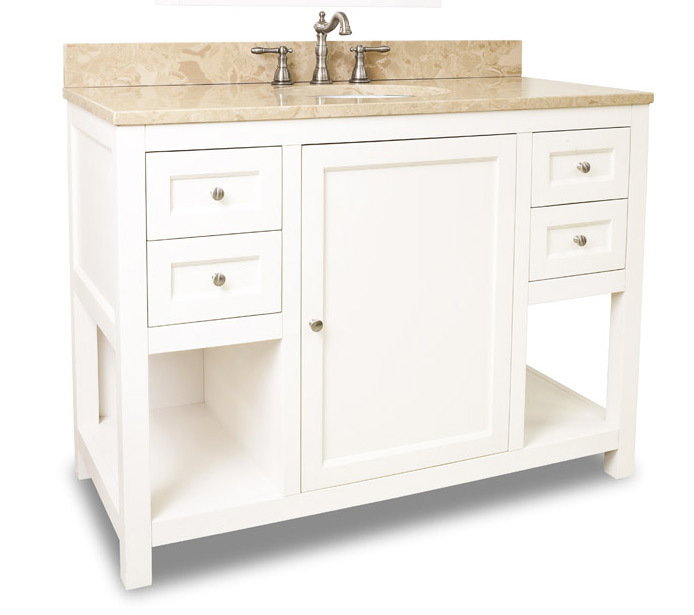 There are double vanity sinks available that can fit perfectly in a master bathroom, and once the couple who has been sharing a single sink begins using a double vanity… there will be no turning back! 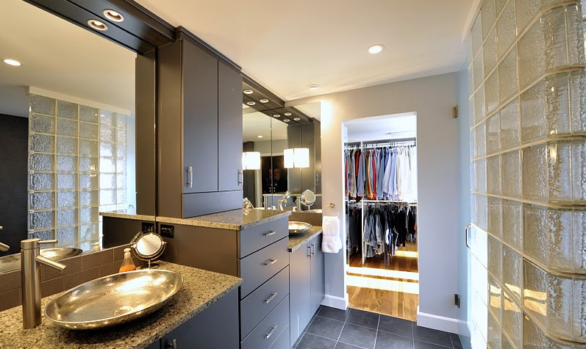 All photos above compliments of Ultracraft Cabinetry.